A free snapshot includes up to 100 recent tweets from the past 7 days (whichever comes first). You can run as many free snapshots as you want. Create a free Union Metrics account to save these reports to access later. 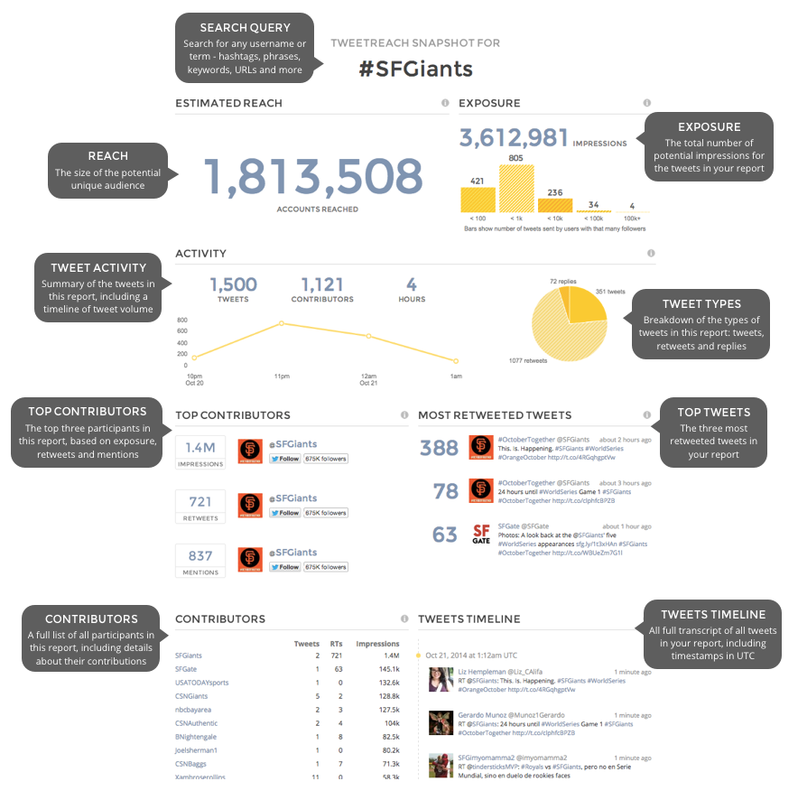 You can also purchase a full snapshot report to analyze up to 1,500 tweets from the past 7 days. To run a snapshot, we need your Twitter credentials to authenticate with the Twitter API. We will not tweet or post on your behalf. When you're ready, run a report here now. Read on for more information about our snapshot report metrics. You can also click here to learn more about what you can search for and supported search queries. This number represents the maximum number of unique Twitter accounts that received tweets about your search query during this time period, based on our robust reach algorithm. Think of reach as the size of your maximum unique potential audience. Exposure is the number of overall potential impressions generated by tweets in this report. That's the total number of times tweets were delivered to timelines, including repeats. And since replies are only delivered to common followers' timelines, we calculate them as a single impression. The exposure bar graph breaks down how many tweets were sent to users with that many followers. This shows the three most retweeted tweets in this report, showing retweet counts for each tweet. This retweet count includes both new-style automatic retweets and old-style manual retweets that start with “RT @username.” In order for a tweet to show up as retweeted in this section, the original tweet must also be included in the report. A full list of all tweets in this report, in reverse chronological order (newest first). This list includes timestamps, as well as start and end times. Reach is the total number of potential unique Twitter users that received tweets about the search term. Exposure is the total number of times tweets about the search term were delivered to Twitter users. We call each receipt of a tweet a potential impression. See below for how we calculate these numbers. Reach provides an understanding of the overall impact of your message or campaign. A high reach indicates that a broad base of different users found your message interesting and spread it to their followers. It often means that multiple unrelated people found out about your campaign from sources outside of Twitter. Conversely, a lower reach means that your message is likely only being shared among a smaller group of people who may be more interrelated (e.g. people in the same geographic area). A high reach will often be combined with a high exposure. Be careful if you notice your campaign has a low reach and a high exposure, that is an indicator that you may have a core of users that are trying to spread your message by tweeting repeatedly but that your campaign is failing to take off beyond those users' followers. A high exposure among a small group of people may mean they feel "bombarded" by your message. You may want to alter your message or seek out other ways to get more Twitter users involved to avoid over-saturating a small group. For more on this, check out our blog post about the reach:exposure ratio and how to interpret it. In your snapshot report, we provide details about the types of tweets we found in our search. This includes how many tweets were standard tweets, how many were retweets, and how many were replies. We break the data down like this in order to give a complete picture of how people heard about your search term. This is particularly important when it comes to replies. On Twitter, a reply is only seen by a Twitter user's followers who also follow the person being replied to. For example, let's say Twitter User A replies to Twitter User B. Twitter User C follows both A and B, but Twitter User D only follows A. C will see the reply, but D will not. We take that into consideration when calculating a search term's reach. We count Twitter User C in our final tally, but not Twitter User D.
We provide a list of all the people who tweeted about your keywords. We call these Twitterers contributors. In our Pro service, you can see detailed influence information for each contributor, including how many followers they have, how many Twitter lists they're on, their Klout score, and much more. You can quickly determine your top influencers and learn who's spreading your message the farthest. You can also see how many impressions individual Twitter users contributed to understand each user's share of voice. We calculate this metric by taking the number of followers a Twitter user has and multiplying that by how many times that person tweeted about the search term. In the case of an @reply from one user to another, that tweet will generate one impression. This helps you know more about who your biggest advocates are. This list is presented in order of impressions contributed, so you’ll see the users who generated the most impressions at the top. Please note that we cache follower numbers for Twitter users with large follower counts once a day, so the exact impression number for people with very large numbers of followers may not include all of their most recent followers, but will be accurate to a time within the past 24 hours. Finally, we give you a list of all the individual tweets we found for your search term. This includes all public tweets that show up in Twitter search. In our Pro Trackers, you can also see a variety of detail about each tweet, including how many impressions it generated, how many times it was retweeted - and by whom - and more. The list of tweets is hyperlinked, so you can click through to a Twitter user’s Twitter page (click on that person’s Twitter username), as well as to the tweet itself (click on the timestamp immediately below the tweet), and any links or Twitter usernames in the tweet text. To see data on all available tweets (up to 1500 tweets from the past few days), purchase a full report now for just $20. Want even more tweets? Check out Union Metrics subscriptions for real-time monitoring (and all the tweets you want).